Lt.-Col. John McCrae (1872-1918). 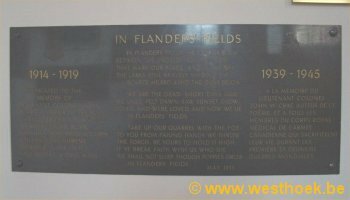 While serving as a military surgeon in Belgium, John McCrae wrote In Flanders Fields, one of the most enduring poems of the First World War. Born at Guelph, Ontario, he was practicing medicine in Montreal when he volunteered, in 1914, to join the Canadian Expeditionary Force which was being sent to fight in Europe. His stirring poem, written near the trenches at Ypres salient, provided a strong stimulus to the Allied war effort. McCrae died in 1918 while serving at a Canadian Army Hospital in Boulogne-sur-Mer. His words have made the poppy a lasting symbol of self-scarifice in war.